As we head into fall, a hearth and mantel factor into so many traditions as well as up the ante on being cozy. 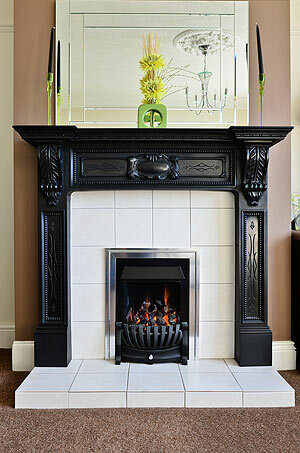 But what would it take to install a fireplace in an existing home? It may be easier than you think, thanks to a range of pre-fabricated options on the market. While a traditional masonry fireplace is a built-in architectural feature, complete with a foundation and footings, a factory-built fireplace looks like part of the home’s structure but is actually more like a built-in appliance. Many factory-built fireplaces can be installed in an existing room affordably with very little effort and without the need for major remodeling. Factory-built fireplaces need no added structural support, and because they have fewer limitations than site-built masonry fireplaces, they can be easily and safely installed in almost any room, including nontraditional locations like the kitchen, home office, bedroom or master bath. Prefabricated fireplaces can burn wood as well as natural or propane gas, with some vent-free gas-burning models available. Electric fireplaces simply plug into a regular wall outlet. This requirement does not necessarily disqualify wood-burning fireplace options, which generally “are a whole lot cleaner and efficient than they used to be,” says Roy Mjelde, owner of Top Hat fireplace and chimney specialists, with locations in Madison and Baraboo, Wisconsin.